As the torrential rain downpour ruined our birthday plans for “The Brit”, I had to come up with plan B for his birthday, and the other plans had to be postponed. 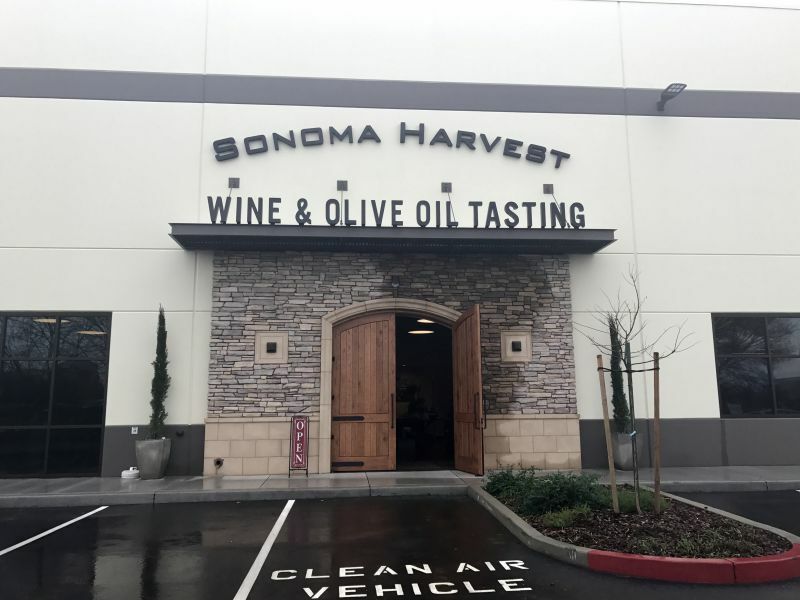 We didn’t want to venture far due to the crazy storms, and then I remembered the brand new Sonoma Harvest Foods Tasting Room that opened in Fairfield, by the Jelly Belly Factory. Hurray! I wouldn’t have to see The Brit with his lower lip out as he wasn’t getting his birthday wine tasting in. Believe me when I tell you, The Brit with a sad lower lip is not anything you want to experience. It is a sad, sad sight indeed. It is a little bit of a strange place to put a tasting room. 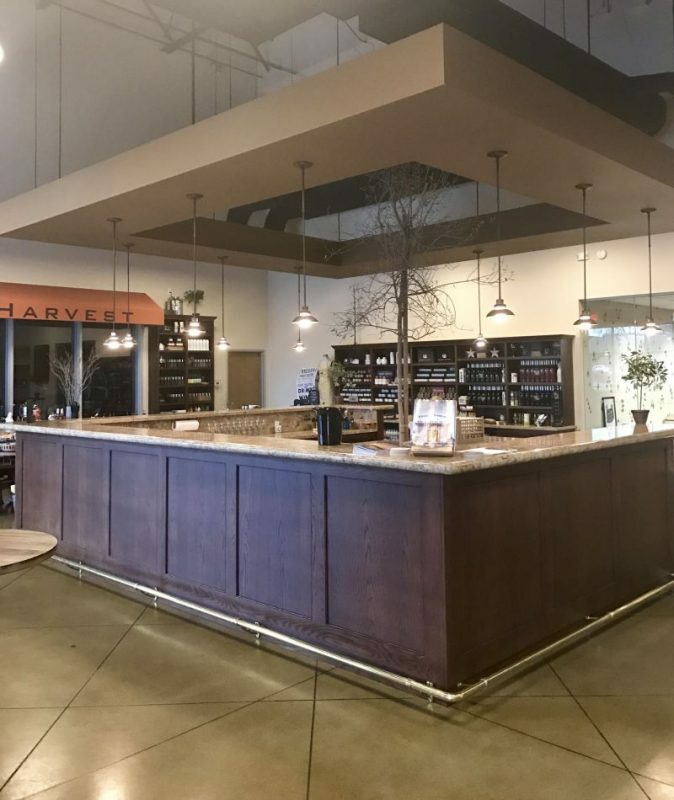 The location is out of the way of all of the other tasting rooms and wine areas around Fairfield. It is located in an industrial park and a bit nondescript. We nearly passed it on the road as it doesn’t face the street. The entry is actually on the side of the building. They have put great big beautiful wood doors on it though so you get the feeling of a winery once you approach. We were very impressed with the tasting room and space as we entered. 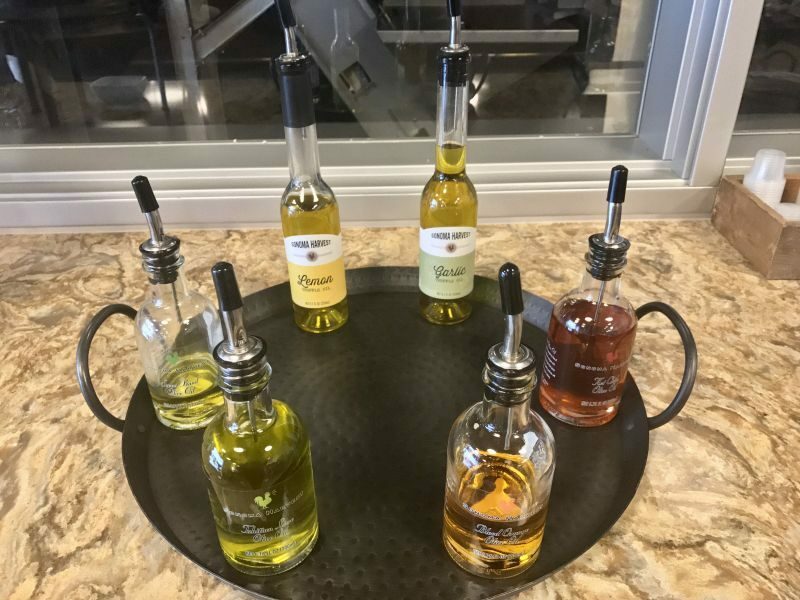 There is a huge tasting bar in the middle, some tables and a display area to the sides and back of the room showing off their olive oils, bottles of vinegar, honey products, and jarred preserves. 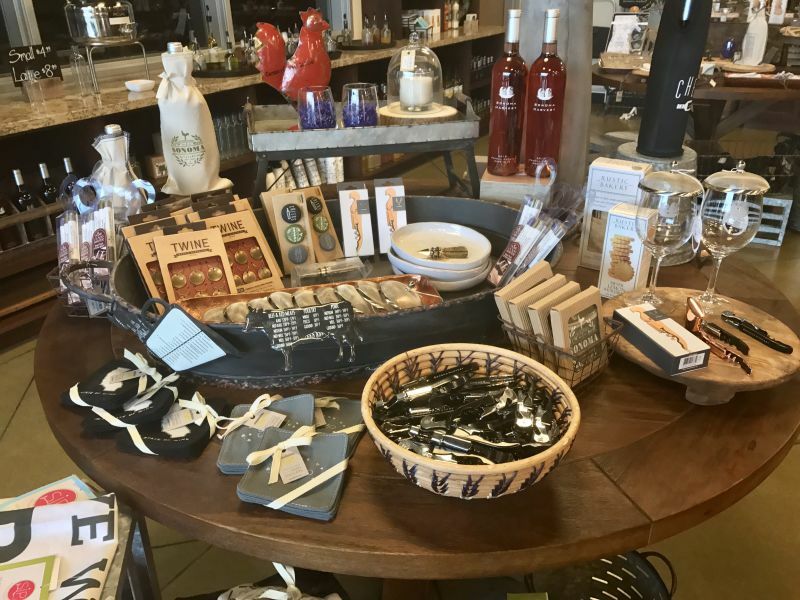 They also have a small area to purchase cheese and meat products to enjoy as you sip wine although they do not offer premade up plates. 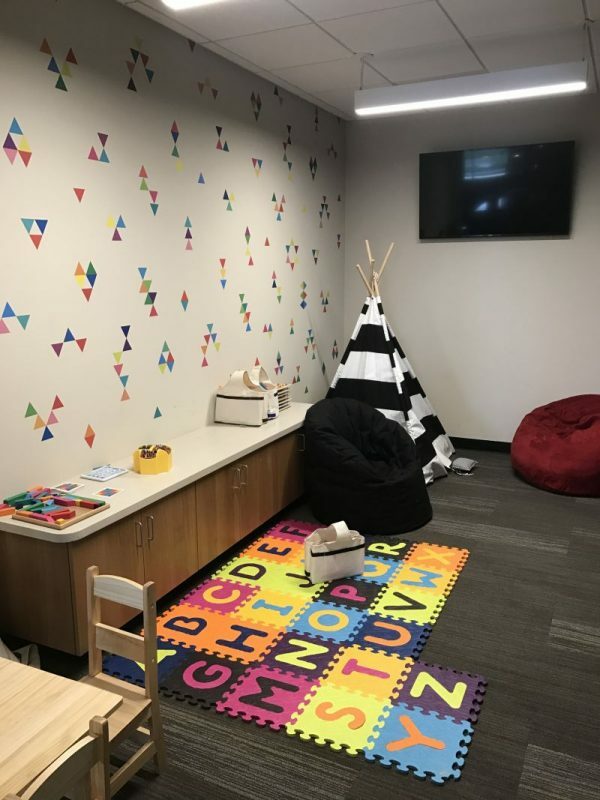 Sonoma Harvest have created a play area for children in the back filled with toys and things to do, so parents can have a chance to enjoy the tastings. 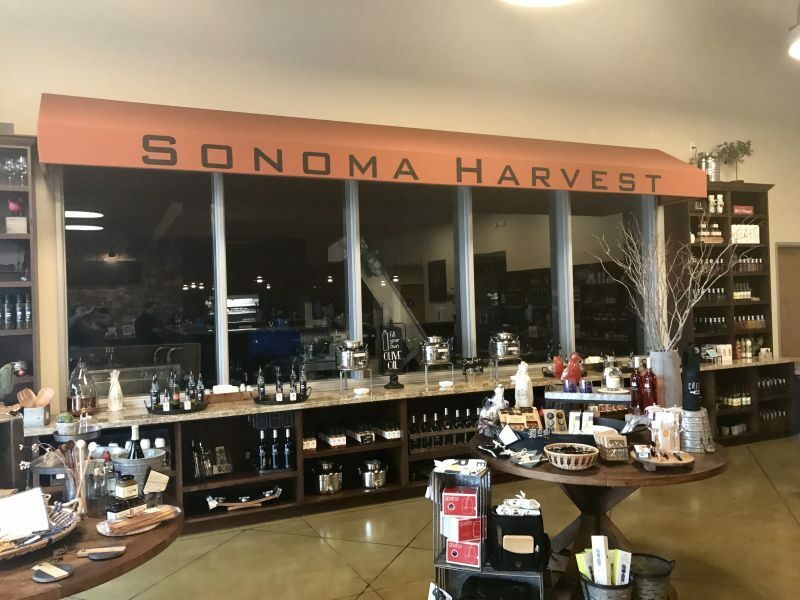 The Sonoma Harvest tasting room offers a selection of four wines. A Chardonnay, a Pinot Noir, a Cabernet Sauvignon, and a Rose Blend. The price range is around the $35.oo mark for each. I think it was a smart line up to start with as those seem to be wine varietals that everyone seems to recognize. 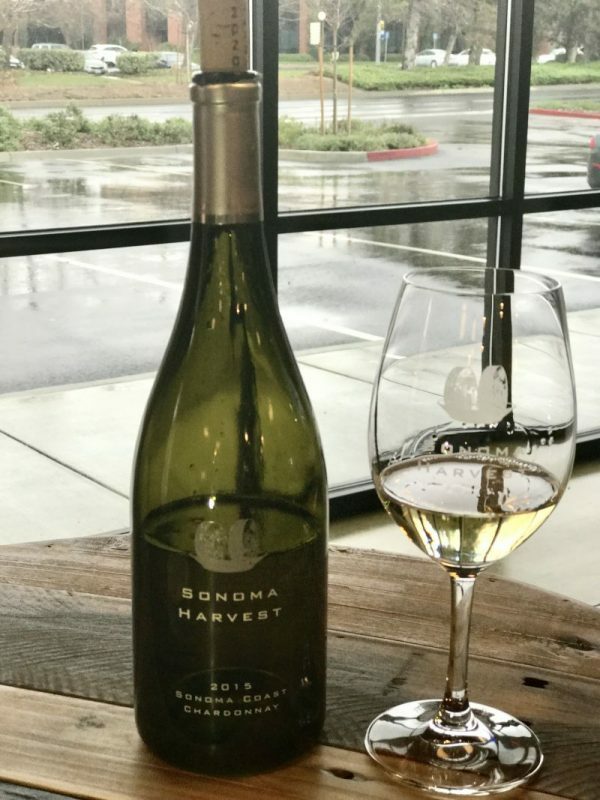 We started off with their 2015 Chardonnay ($28). I got hints of wood and nuts on the nose. On the palate, there were plenty of notes of butter, oak, and fruits. For me, the fruit component was too far out of balance in its lack to be a really great classic example of the wine I was drinking. I think it is fair to say that I enjoyed my sip, but wasn’t wowed by it. Moving on we sampled the 2015 Pinot Noir ($34). I had notes of both vanilla and caramel on the nose, with a hint of plums. This smell made me smile and anticipate something wonderful. The flavor on the palate indeed had hearty dark plums with a deep smokey finish, but honestly, this wine felt too rough to me, as though it needed aging. It was not smooth or supple as you would find most Pinot Noir examples to be. I truly believe, however, given a bit of time this wine will mellow and find its feet and become something really good. I am wondering if I should buy a few bottles for my cellar to test out my theory. The 2014 Cabernet Sauvignon ($35) was next in our tasting. I have to say that I didn’t particularly enjoy my sip of this wine. For me, the body of the wine was too light for a cab, and it didn’t have enough tannin or structure. It has a short, smokey finish that left me feeling meh. It is very young but I am unsure it will age into anything great. I can think of plenty examples of cabernet sauvignon for less money that I would prefer to drink. Our final wine was the 2015 Rose blend. If you enjoy sweeter wines, this one is for you. I actually enjoyed this sip, although it doesn’t tend to be my style of wine drinking in general. The flavors were really round and fruity without being overly sweet or cloying. I thought it would be a nice drink for a hot summer’s day, at a barbecue filled with light fresh food. As much as wine seems to be the center of this tasting room, Sonoma Harvest also carries flavored olive oils, jams, extracts, relishes, and other gourmet food items. We set off around the tasting items savoring each one. As I cook, I am always on the lookout for these types of items to inspire my cooking and help bring it to the next level. I was delighted with the quality of the products and the variety as well as the interesting and innovative combinations. I purchased a bottle of their green onion infused olive oil ($12.99). I was so impressed with its flavor. 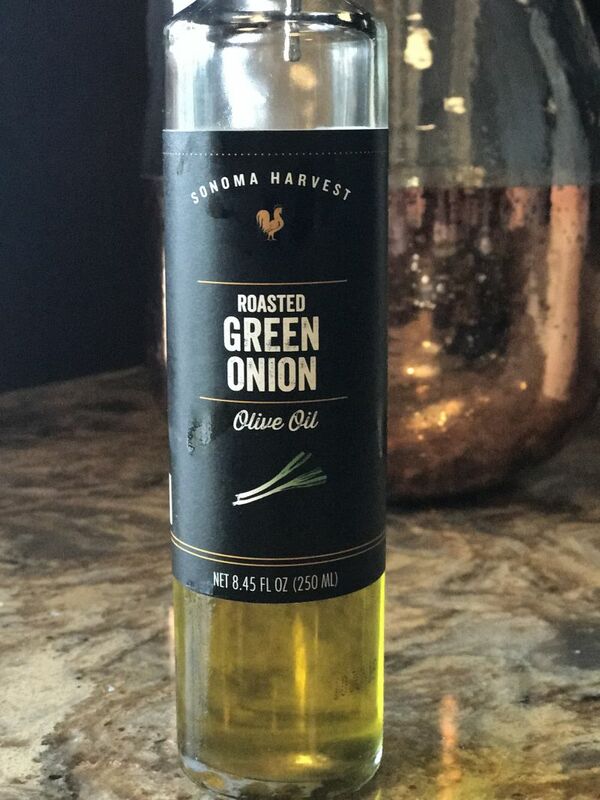 I often use infused olive oils and that unique combination of the green onion just did it for me. The green onion really comes to the forefront of its flavor. 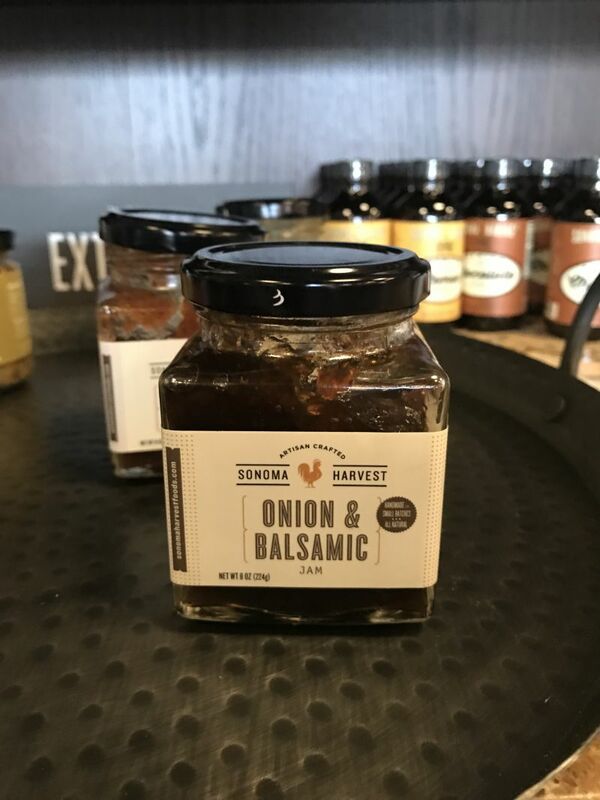 I also purchased a jar of their onion jam. ($7.99) Absolutely delicious! I think this was my favorite purchase of the day. The jam is amazing with charcuterie platters and cheese plates. It has that whole sweet and savory thing going on and I have to say that I am a huge fan. I would highly recommend this one. It is far superior to similar products I have purchased at places like Trader Joes. The Vinegar section overwhelmed me with its deliciousness. 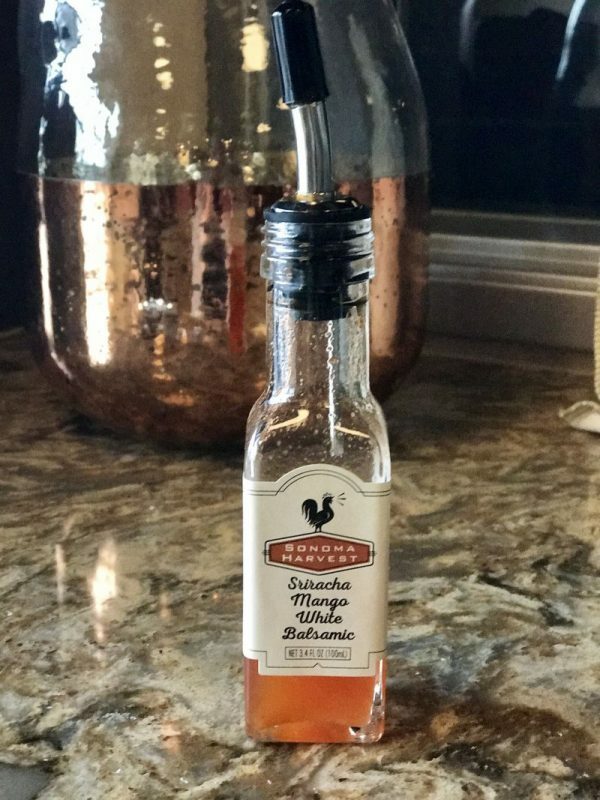 The bottles of vinegar ranged from $13-$16. I was in love with all of the flavors and combinations. 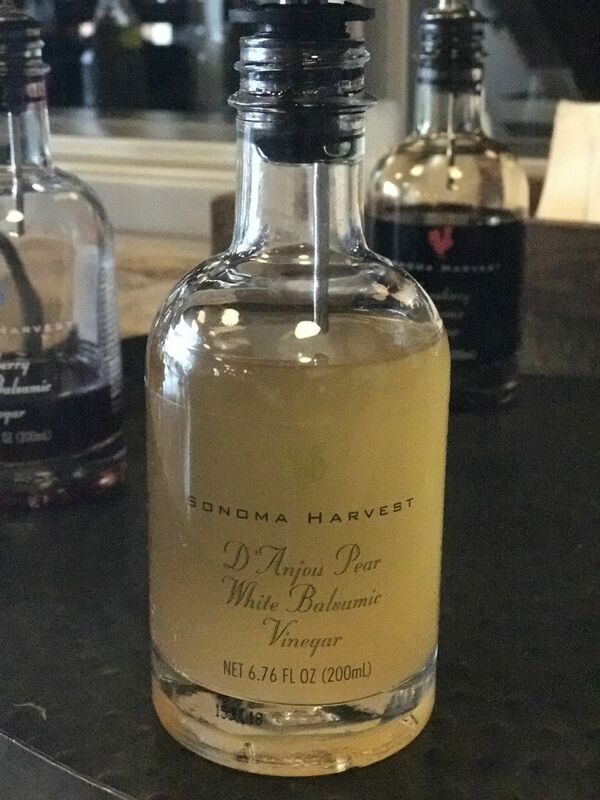 Finally, after testing them all and realizing I couldn’t take them all home, I settled for a bottle of the barrel-aged vinegar and a bottle of the pear vinegar. They do have a sample selection for sale in a gift box for a very reasonable $20. 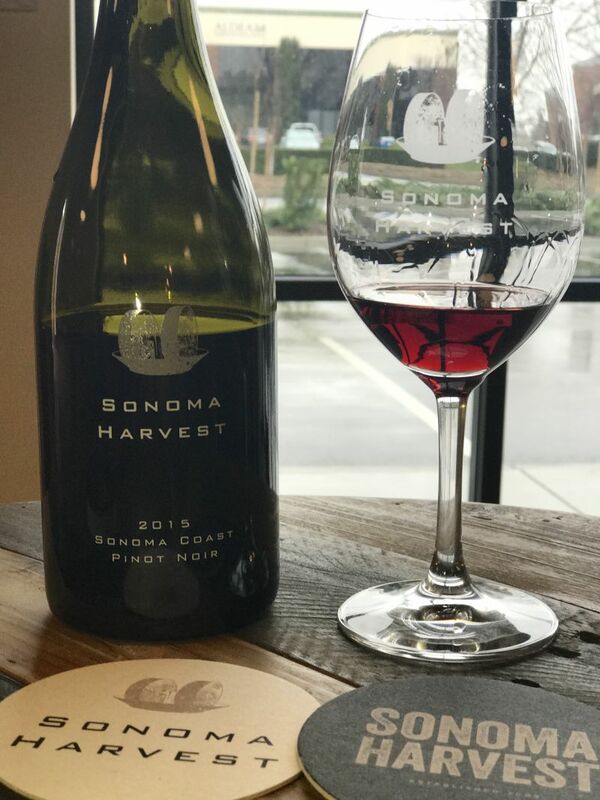 Maybe I will have to revisit Sonoma Harvest to purchase that, as I feel like I need to take more time sampling each one. 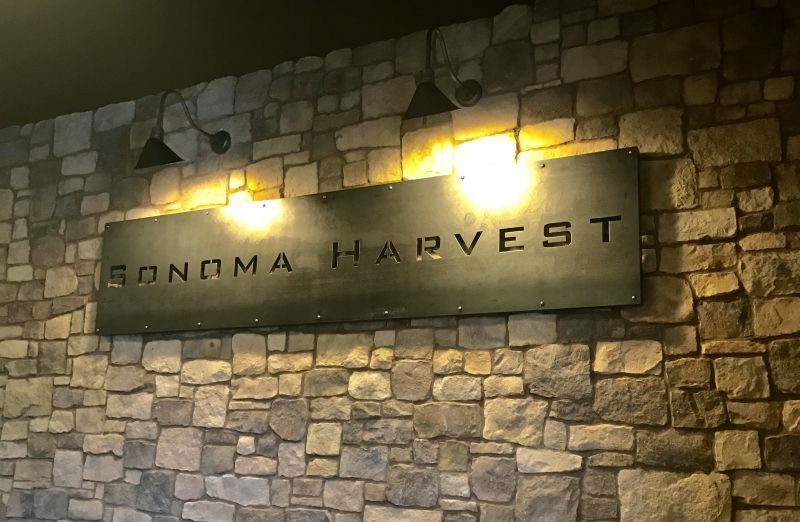 Here are a few exciting things about Sonoma Harvest to take note of. First, they are open every single day from 10 a.m. to 6 p.m. I saw an announcement on Facebook that they are doing a Happy Hour with longer opening hours on Wednesdays until 7 p.m. This place has absolutely everything going for it to make it a great addition to our up and coming wine tourism area. I am looking forward to seeing how the wines evolve from this place (along with the other young wineries in our area). I would highly recommend that you show your support and put them on your list of must-visit places.